Ah the first day of Spring! Feels like a long time coming and that the season is still behind despite the 80 degree temperatures this week. Very little movement so far in the perennials, a few forsythia blooming, some green buds on the poplars and the blueberries are sending out flowers. We know that it will all move fast soon and we must stay on schedule to keep up. This week was time to slide the little tunnels and get ready to plant the very early tomatoes. It is a two day process with the first day spent preparing the beds for tomatoes, cucumbers and other early warm season crops, including final tilling, irrigation lines, landscape fabric and building the trellis to support them later. The second day we first have to unbolt the sliding tops from the rails, take off the end walls and other preparations so they will move easier. Back in the day we used to slide them with just four of us but we must be getting weaker or they are getting heavier. We now do it with at least six folks which means coaxing extra friends out to the farm for literally 10 minutes of work. We only move two of the six tunnels by hand, the rest with the tractor. This year I was able to get four students from my Advanced Organic Crop Production class to come out. After the intense 10 minutes and after the additional helpers head off, we have an afternoon of rebolting, re-installing the end walls and general tidying the area but it is done and despite the yearly work of moving them we still think it is a superior system to stationary tunnels as far as soil health and production are concerned. 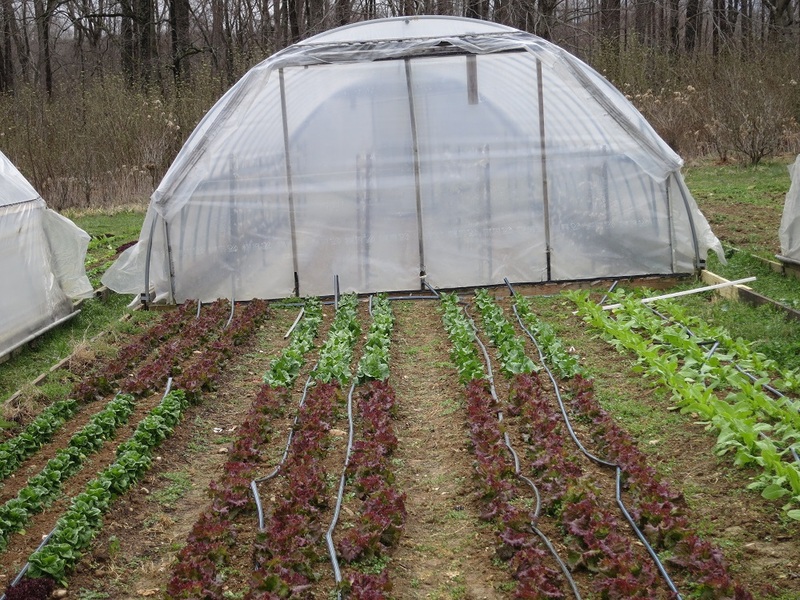 Newly uncovered lettuces, almost ready for market and covered tunnels ready for tomatoes next week. A world of beautiful Anemones in blues, purples and reds and the rose like Ranunculus in yellows, oranges and crimson. Perfect for spring. ← Peregrine Farm News Vol. 12 #3, 3/13/15, Like a phoenix! Always enjoy your newsletters – thank you. Could you put 2 bags of spinach aside for me please? Many thanks and look forward to seeing you in the morning. PS Last week’s ranunculus are still looking lovely! Started 3rd week of January, 3 plantings a week apart. Thanks Alice, what a crazy spring! You all will get it all in, don’t worry.